I have been looking for a book that provides some solid direction for those who are seeking to start a gathering that is particpatory and Spirit-led or who want to see their gathering supernaturally empowered in a greater way. 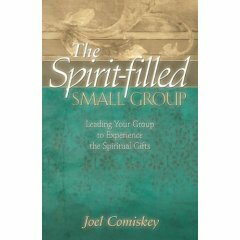 Joel Comiskey's "The Spirit-Filled Small Group" fits this bill quite well. This is an excellent primer for learning how to facilitate Spirit-led, participatory church gatherings. It is also more than a primer. Comiskey provides solid biblical and historical background to the significance of small groups as the key to transformation. He also presents practical tools for facilitators of small groups (or house churches) who want to see their gatherings empowered by the Holy Spirit while releasing every person to express his or her spiritual gift. "The focus in many of today's small groups has shifted from Spirit-led transformation to just another teacher-student Bible study. But exercising every member's spiritual gifts is vital to the effectiveness of the group. With insight born of experience in more than twenty years of small group ministry, Joel Comiskey explains how leaders and participants alike can be supernaturally equipped to deal with real-life issues." "Only God's supernatural power can draw people to the truth and liberate them to be all that God wants them to be." "What excites me most about small group ministry is the intimate home atmosphere in which God has the perfect opportunity to change people's lives, prepare them for ministry and further His kingdom work." "People are inundated with information; what they need is transformation." "Sensitive small group leaders ask the Holy Spirit to manifest the needs of the members, knowing that the best agenda is the one that meets the needs of those present." "The church is a hospital-not a performing arts center." "Gifts are not primarily related to institutional maintenance. Gifts are related to the building up of persons and are best exercised in direct person-to-person contact." "In a loving environment, group members are willing to risk and use the gifts they have." "The Spirit-filled small group was the ‘normal' Church in the New Testament; it was never seen as an ‘addition' to the ‘real' Church. The small group was the Church." Comiskey provides a wonderful background on the working of the Holy Spirit, the gifts of the Spirit, and how gifts work within the small group context. His personal experience with small groups is apparent in that his insight is not merely theoretical but practical. My only minor disappointment is that he has very little focus on the missional nature of small group life. I recognize that this is because of his own church context. This in no way detracts from the book--it is simply a significant missing piece when seeking to understand the house church concept overall. Good resource for those wanting to see a better spiritual flow in their house church gatherings. Just a note of thanks to all who participated in the last post by sharing their deconstruction stories. I have found it very, very fulfilling to get to know many of you in this way. It's amazing the diversity of backgrounds and experiences, yet the similarity of how God is working in moving his people toward simplicity and freedom. If you have not yet, feel free to scroll down to the previous post and join the story-telling! I am looking for people's stories of deconstruction from traditional church. What caused you to begin looking at the way you were doing church? What was the process you went through? What were the difficulties you faced? How was your thinking and understanding changed? What has been the result in how you understand and experience "church" today? I am looking for more than "I was hurt by this church or that person so I decided to do a house church." I want to hear about how your paradigm, understanding, and values surrounding church changed and what catalyzed that. I would love for you to share a link or reference to someone else's story, or share your own story here in two or three paragraphs (comments below). I often tell people that I experienced the full cycle of traditional church life: I gave birth (founding pastor of a church in California); I helped build (buildings, services, and staff over a ten year period); and finally I completed the cycle-- I burned out! At the ten-year marker I suffered from a very severe burnout/depression that was so debilitating I was unable to continue in my role. Given a long-term sabatical, I was able to begin the recuperation process and the re-evalauation process. What had gone wrong? Why would ministry lead to burnout? How had I gone from being a simple pastor of a few families to a CEO of a business budget, a staff, a ministry team, building projects, and a vision for more and more of the same. I simply thought I was advancing the kingdom by building the church! Yet this type of church I had built just about killed me off! One thing I was able to grasp was that I was not doing what I had been designed to do. There was certainly much to look at on a personal level: my own insecurities and need to build a bigger-is-better type of church, for example. But I also began to look at the whole package I understood as "church." What part of the organization and buildings and staff and structures and programs really are essentially church? If they are not essential, are they even helpful for truly advancing kingdom life? These types of questions got me back to the basics: church as people empowered by a living God. It is people filled with God who impact other people, not services and events. I began to see the potential of God's people released to just be his people with simple, relational gatherings to support each other. I began to see the power of every person living missionally, relating authentically, and caring for one another in the process. To use an analogy I have used before, I began to see how much effort I had spent trying to build a beautiful fireplace to contain just a little bit of the fire of God when God wanted to unleash a wildfire. That's just the beginnings of what has become an awesome, freeing journey.